With one day left in the sign-up period for private insurance coverage, the Connecticut health insurance exchange’s enrollment has slowed down compared to past years, and the marketplace’s chief executive thinks confusion about the future of Obamacare could be a factor. The open-enrollment period for private insurance sold through Access Health runs through Tuesday. For the past few days, between 100 and 200 people have been signing up daily, Wadleigh said – far fewer than in previous years. On Monday, the exchange’s call center saw a jump in calls, but Wadleigh said it wasn’t yet clear whether that will translate to more enrollment. As of Monday, just over 108,000 people had signed up through Access Health. Last year, it was closer to 110,000, and after heavy volume in the final days, the open-enrollment period ended with 116,109 people signed up. “I’m not sure I see us getting to that point,” Wadleigh said. The future of the Affordable Care Act has been unclear since the election of President Trump, who pledged repeatedly to repeal it. He has promised that it will be replaced, although the White House has not released a proposal. Republicans in Congress have released multiple proposals, but it’s not yet clear what might move forward. As of now, the health law still stands, and that includes requiring people to have coverage or pay a penalty, unless they qualify for an exemption. The penalty for not having coverage during 2017 is either 2.5 percent of household income or $695 per person (or $347.50 for a child), whichever is higher. “I’m ultimately worried that a year from now, customers will be calling up complaining, saying they now have to pay a penalty and it’s our fault,” Wadleigh said. 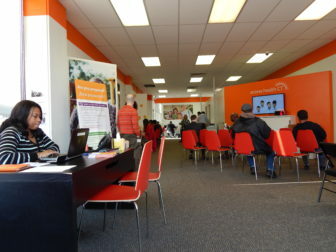 Access Health’s call center will be open until midnight Tuesday, as will the exchange’s two storefront enrollment centers in New Haven and New Britain. The open enrollment period applies to people buying individual-market coverage. People who qualify for Medicaid can sign up at any point during the year. For more information on signing up for coverage, click here, or visit The Mirror’s Guide to health care in Connecticut.